Word OLE (Object Linking and Embedding) object is used to make contents, created in one program, available in Word document. For example, users can insert an Excel worksheet in a Word document. Both Linked object and Embedded object can be used between Word and other programs. The data of Embedded objects is saved in Word and should be updated manually, while data of Linked object remains as separate file and will be updated when source data is changed. Spire.Doc for .NET , a professional component to manipulate Word documents with .NET, enables users to insert OLE objects in Word by using C#/VB.NET. This guide will show you how to insert one kind of OLE objects, Linked objects (an Excel Worksheet) in Word. Users can invoke paragraph.AppendOleObject(string pathToFile, olePicture, OleObjectType) method to insert OLE objects in Word. The parameters, olePicture and OleObjectType are properties of DocOleObject class which is provided by Spire.Doc for .NET. 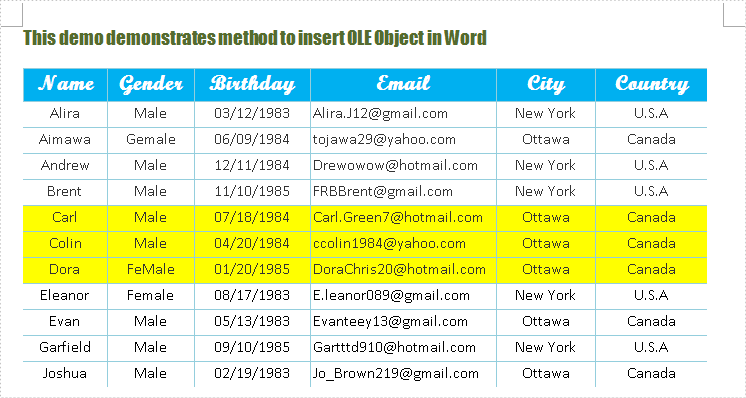 The following steps present details to insert OLE Objects in Word. The following demonstrate a document before insert the OLE Object into Word, and at the bottom, you can find the result screenshot after inserting. Before starting with the steps, download and install Spire.Doc for .NET on system. Step 1: Define a GetExcelImage(string ExcelFile) method to get olePicture. Actually, the olePicture is image of data information in original Excel worksheet. The image is generated from Excel through Spire.XLS for .NET that will be shown in documents after inserting OLE object in Word. Double click this picture and you can get the original worksheet. Step 2: Insert OLE object. After adding paragraph in Word document, declare a new DocPicture. Then, use GetExcelImage(string ExcelFile) method which is defined in step 1 to get image source and then use picture.LoadImage(Image) method to load this image. Finally, insert OLE objects.